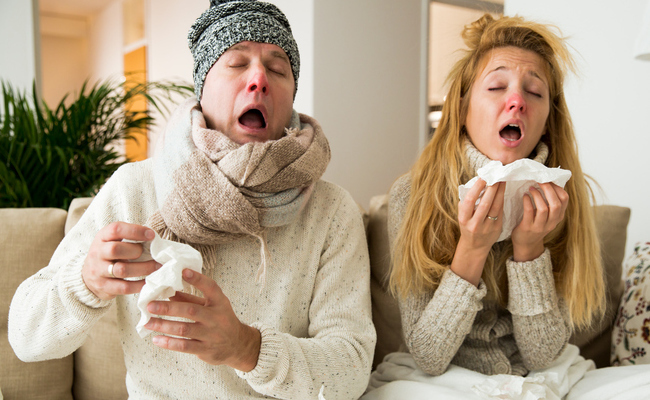 It’s cold and flu season, which means it’s time to talk about secondhand sickness. It’s happened to all of us. A child or significant other gets the flu. You lovingly, selflessly take care of them. And how, how does the universe repay you? You get a bout of the flu yourself! Come on, this is kindergarten stuff. If you’re worried about getting sick, wash your hands regularly. Whenever you get a chance, suds up with some mild (not antibacterial) soap and warm water. And be conscious about touching your face. The majority of germ-spreading can be stymied with basic preventative techniques. Making sure your body is properly hydrated is a great offensive strategy if you want to keep your immune system strong and supported. Without proper hydration and electrolyte balance, the immune system becomes ineffectual against the bacterial/viral onslaught that is cohabitating with a sick person. Start every day with 32 oz. of warm lemon water and keep sipping waters and herbal teas throughout the day. We all know that sick people need plenty of sleep, but so do the people taking care of them. First things first, don’t sleep in the same bed as a sick person. You’ll be up all night and drastically increase your odds of contracting their illness. Instead, set yourself up on a guest bed/couch and aim for a solid night of rest. Sleep is a powerful immune supporter. If you’re not getting enough of it, you’ll have a weak line of defense when it’s time to actually fend off germs. Thank Gaia, nature has a few tricks up her sleeve when it comes to natural immune-boosting. If someone close to you has the flu, taking elderberry syrup can actually prevent you from contracting the influenza virus. That’s right, prevent. The anthocyanins in elderberries have been shown to have powerful antiviral properties, meaning it can potentially stop any mischievous secondhand viruses in their tracks. If you end up with a cold or the flu, research has shown that elderberry can drastically reduce the duration and severity of the illness. Thyme, oregano and garlic all also have antibacterial and antiviral properties, so sprinkle those liberally on your food. Really amp up the self-care. Try to avoid running around stressed, sleepless and headless when you are taking care of a loved one. While you are prioritizing your loved one’s care, make sure to prioritize your own self-care in tandem. Airlines have it right. Place the oxygen mask over your own face before helping others. How can you take care of anyone if you are burned out, bitter and coming down with the sniffles? Take baths, meditate, do some gentle stretching and be extra kind to yourself. You deserve it. Do the people around you get sick often? How do you manage to stay healthy while you’re taking care of them?